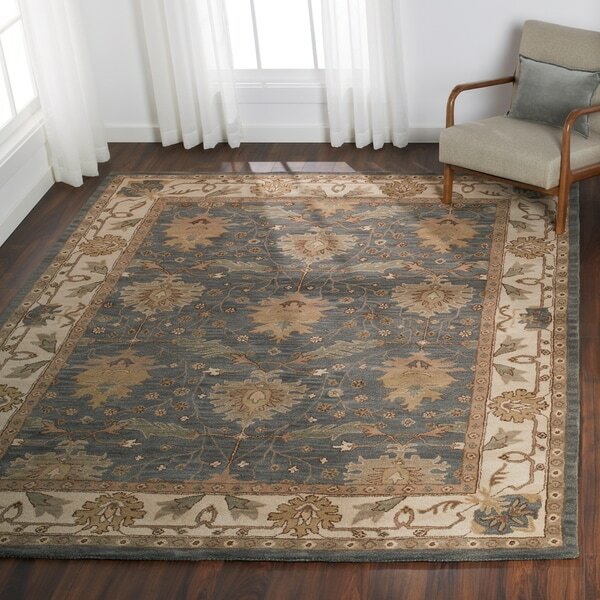 Nourison India House Charcoal Ivory Traditional Area Rug - 3'6" x 5'6"
Give your home a touch of palatial elegance with this beautiful area rug. Featuring an exquisite medallion pattern in soft shades of charcoal and ivory, the rug enhances any decor with traditional sophistication. Use this sumptuous rug in your living room, or step into its generous 0.75-inch-deep pile whenever you climb out of bed. The rug's subtle grey pattern makes it ideal for both modern and traditional decor schemes. Place the rug over your existing carpet,or add a non-slip backing before you use the piece on hardwood,laminate or tile flooring. The soft, hand-tufted wool is plush underfoot. The India House rug features a strikingly sophisticated contemporary motif and is meticulously hand-tufted of an opulent 100% wool pile. Dimensions 96.0 In. X 60.0 In. X 0.5 In.